Do you wanna make a Snowman? 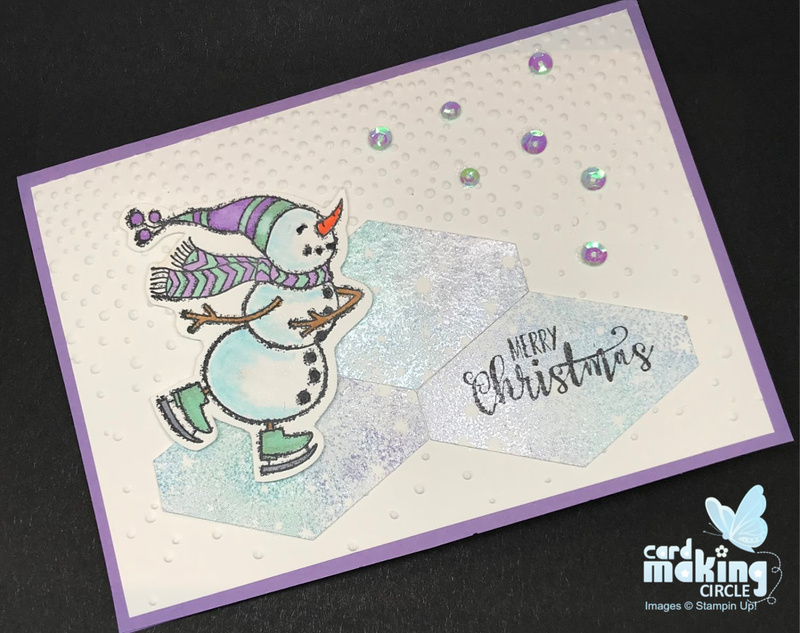 Come and join the fun of making Christmas snowman cards! You'll enjoy the diversity of these festive cards. From simple designs to more involved techniques. Before starting your cards check out your card sizes and layers. This delightful card was created using a single stamp. It's origin is long forgotten as I've had the stamp for more years than I can remember. Stamp the image in basic blank ink and colour in your preferred colouring medium. If using alcohol markers remember to use Memento black ink. Cut around the image and mount onto a card base. I love using unusual or unexpected colours for cards. Use patterned or designer paper for the background layer. Shape a strip of white glimmer paper to make a snow bank and mount onto your background layer. Cut out a snowman image and mount with foam pads. This was cut from some designer paper from Stampin Up! 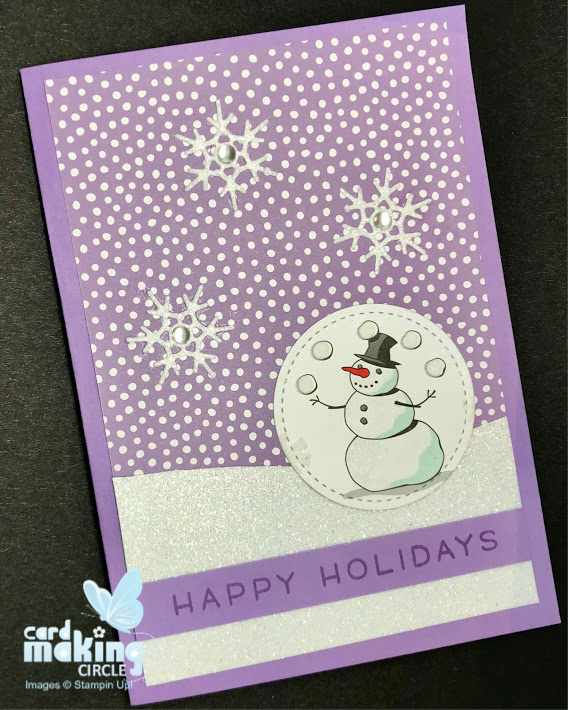 Add a few punched or die cut snowflakes from the glimmer paper with a sparkly embellishments for the centre of each snowflake. Complete with a simple sentiment strip. 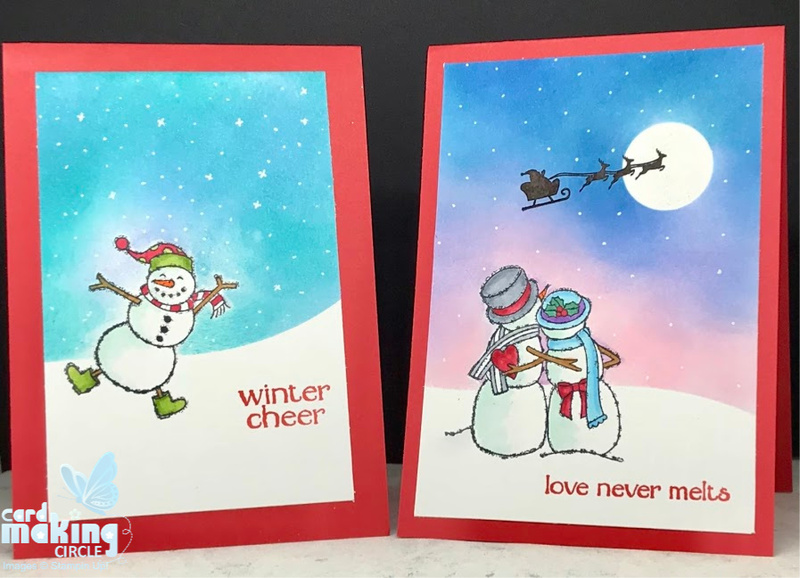 These two cards were creating using the blending technique with distress inks. Before you start think about your overall design and where you want the snowmen. Stamp them with basic black ink (or Memento ink for alcohol markers). Create a mask for your stamped snowmen by stamping onto a Post It note or masking paper. Use the mask to cover the snowmen. Cut snow banks and a circle masks for the moon to further mask your card. Once fully masked slowly blend the inks into the paper starting with the lightest colour moving through to the darkest. When dry add snowflakes with a gel pen and colour your snowmen. Add light shading to the moon and Wink of Stella to make it sparkle. Stamp your sentiment and add any other stamping. Finally trim to size and mount onto a card base. This card uses the Bokeh Dots stamp from Stampin Up! Apply 3 different coloured inks with a sponge to the stamp to create a mottled effect. Gently add a thin amount of Frost White Simmer Paint with a sponge dauber. Then stamp onto white card. Use a separate piece of white card for your top layer. 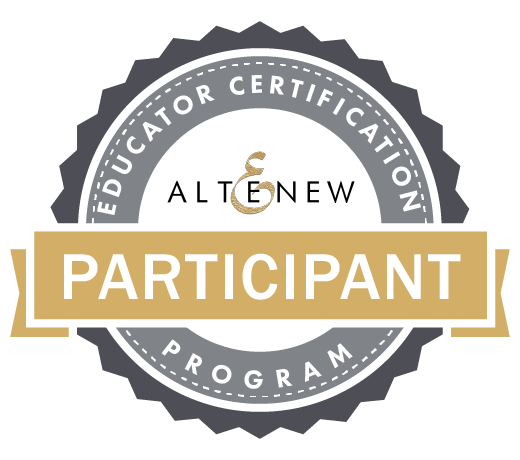 Cut a rectangle window and mount your stamped image behind. 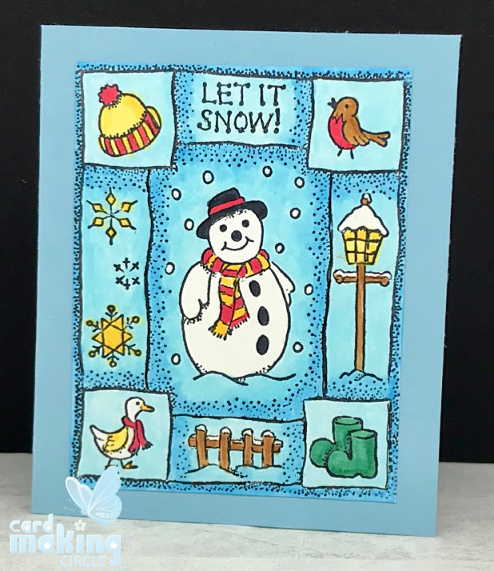 Stamp, colour and cut out your snowmen images. Add a sentiment and a few snowflakes. Mount onto a matching layer before mounting onto the card base. To complete add your snowmen images with foam pads for added dimension. Create more sparkly backgrounds with the Bokeh Dots stamp as outlined above. Punch out shapes with the Tailored Tag punch. 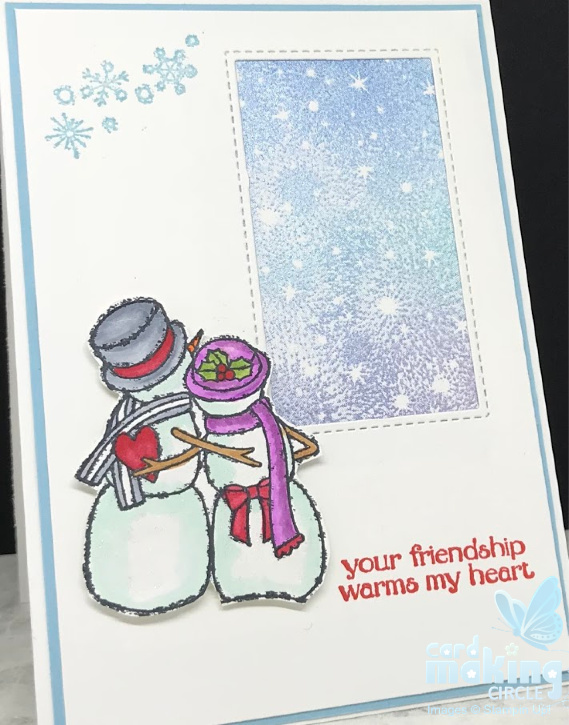 Dry emboss a layer of white card with a snowflake embossing folder. Stamp your skating snowman image, colour and cut. Mount the embossed layer to your card base. Stick your punched shapes to create a skating area. Stamp a sentiment on one of the shapes. Add your snowman with foam pads. Add coloured sequins for added glitter. The only problem with this card was adding the sequins - I managed to get glue everywhere!